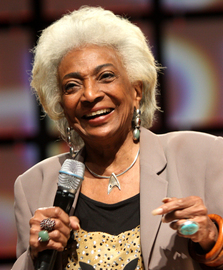 Nichelle Nichols is an actress, singer, and voice artist. She sang with Duke Ellington and Lionel Hampton before turning to acting. Her most famous role is that of communications officer Lieutenant Uhura aboard the USS Enterprise in the popular Star Trek television series (1966–1969), as well as the succeeding motion pictures, where her character was eventually promoted in Starfleet to the rank of commander.